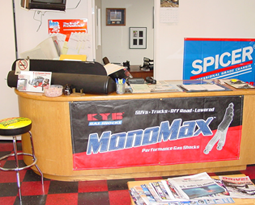 Enhance your vehicle's performance with brake and suspension services from our auto repair shop in Portland, Oregon. Since 1984, Ron's Front End & Brake Service has been providing you with the basic auto repairs you need, including suspension, strut, and brake services for any make or model car. We only use major brands on our services to ensure you get the best results from your repairs. Additionally, we are capable of working on motor homes up to 28 feet and pickup trucks up to 1 ton. Ron's Front End & Brake Service works on any make and model of foreign or domestic cars, trucks, and motor homes. From resurfacing rotors and packing bearings to replacing shoes, pads, and rotors, our brake services are your best bet to being able to stop on a dime every time. We also bleed and flush your brake systems, as well as provide services to the master cylinder for ABS systems when necessary. Your ABS system actually keeps your car in control, and it is important to always ensure it is working correctly. For brakes, calipers, rotors, drums, shoes, master cylinders or wheel cylinders contact us today for more information on our reliable brake services. Ron's Front End & Brake Service can enhance your hot rod with our great optimization services. Our auto repair shop has a way of finding and fixing things like no other shop in the area when it comes to older cars. We are especially skilled when it comes to finding parts for domestic vehicles from 1938 to the present. an appointment for a free brake and suspension inspection. Try Their Road Master™ Suspension Today!